With summer fast approaching, the anticipation for certain seasonal events seems to grow day by day along with the temperature as it inches its way up the thermometer: a trip to the beach, wearing shorts and sandals, indulging in heaps of ice-cream, and finally eating outdoor cooked food especially the American summer classic, barbeque. With this fore-mentioned cooking style missing from my blog site, I have been quite lost in finding a suitable place to write about, given the large number of places that serve such offerings. Well, Social Media to the rescue. I was checking in on one of the food review sites when I noticed a short write-up on a barbeque place in my neck of the neighborhood. In the quick posting, the reviewer mentioned that an old barbeque house had been taken over by a culinary chef whose CV (link) reads like pedigree background. He was raving about the different offerings, some traditional and some definitely out of the proverbial box. Having read this, I knew there was no room for hesitation, doubt, or vacillation to step into this establishment located only a few miles down the road from my front door. Located on the southbound side of the busy Route 1 (it’s tricky crossing the wide road with dashing traffic) in Laurel, MD, just across PG into Howard county, RG’s Barbeque Café is a small shack dwarfed by some larger business sandwiching this establishment. I must admit that I had passed by this barbeque house many a times, but not much about its exterior was appealing enough to draw me through its doors. But it now has a new owner who knows something about the restaurant business (including having competed on Iron Chef), and it has gone through a renovation with a new large sign, bright walls, and flowers beautifying its front. Well, as the saying goes, the proof is in the pudding, so here we go. Stepping into the place, you notice a few tables encircled by large windows on three sides, with the order counter on the other end. The menu is the old style push letter board with all the offerings advertised, while the specials are posted on a board in the dining area. The first set of listings are Sandwiches which comes with the various barbequed meats: Pit Beef, BBQ Beef, Pulled Pork, Pit Ham, Pit Turkey, and Grilled Chicken – I decided to get the perennial favorite, Pulled Pork. 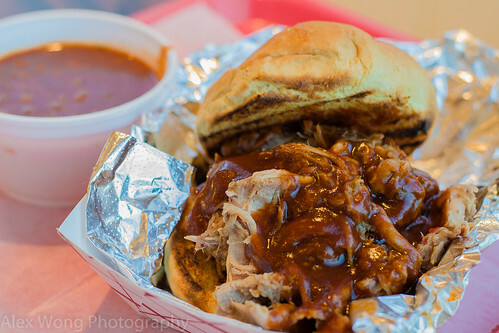 The sandwich arrived with toasted buns filled with a heaping of shredded pork topped by the house-made sauce. This version does not disappoint those who are fond of this popular sandwich: the meat was tender and moist with a faint hint of smoke, while the vinegar-based sauce added the bold balance of acid, sweet, salt and quite a hit of spice heat to each bite, delectable enough for me to finish off the mound of meat in one siting. A side of Baked Beans was the perfect strong partner in this combo – sweet, smoky, soft beans, and spicy from the use of chili heat. Definitely, the sandwich measures up to the high expectations of this classic. 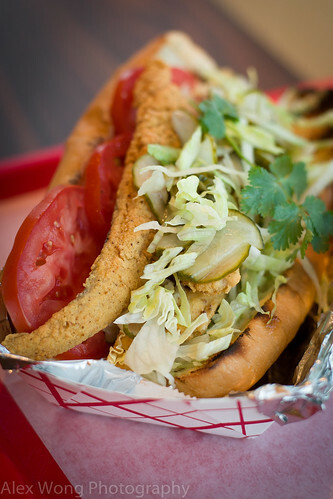 The other sandwich which is not typically a barbeque offering is the New Orleans classic, Fried Fish Po’boy. The long sandwiched arrived packed with all its goodness – fried whiting, lettuce, tomato, house-made pickle, all slathered with the equally freshly-made remoulade sauce. The fish had a mild clean flavor, moist yet crispy from its light outer white cornmeal batter. The lettuce was a combination of mixed greens and the ripe-red tomato exuding its sweet moisture. The pickles added some of its sweet and sour touch along with a slight crunch. But what ties all the elements together are the quality bun that is light and soft yet strong enough to hold this heap together, and the “fantabulous” sauce that is rich, tangy, sweet, and packed with bits of pickles that takes each bite to its heavenly stratosphere. This is Nawlin’s foodgasm! 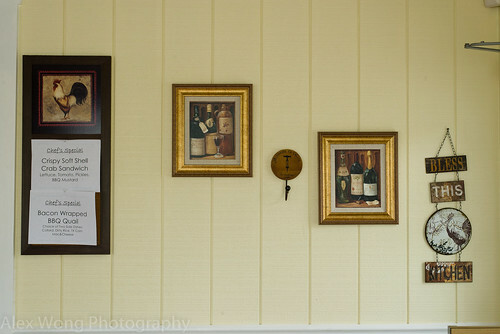 The house offers more than just the usual smoked offerings – Hamburgers and Hot Dogs. A dining companion decided to order the Snoop Dog consisting of a half-smoked hot dog, crispy lettuce, ripe tomato, collard greens, pickles, onions and mustard ketchup. According to the diner, it was quite a tasty bite but it was a bit too much for him to wrap his brain around. 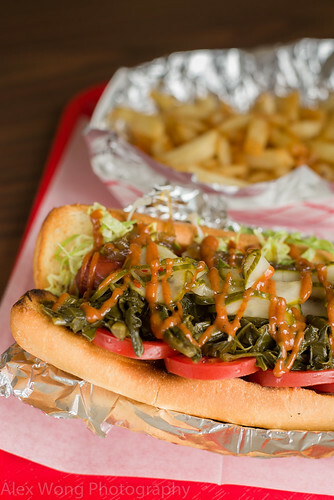 It is definitely a supped up version of your regular hotdog, with its smoked sausage, slightly tangy collard greens, and a topping of the sweet tangy sauce, alongside the usual accouterments. For my friend, this order had a bit of soul and funk(y) at the same time. Maybe it is the perfect order for the more adventurous or those with a case of the munchies (Snoop Dog?). Well, now to the main smoked meats. On another visit, another dining companion ordered the Half Rack Ribs. I couldn’t help but take a few bites from his plate. The meat’s exterior was slightly crispy and well caramelized from the long stay on the oven rack, fragrant from the use of wood smoke, moist in the inside and literally possessing a fall-off-the-bone tenderness. I enjoyed this classic barbeque prepared the correct way with all the various elements coming together to give you the perfect barbeque. 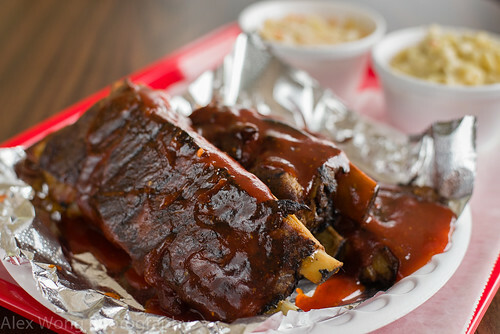 The topping is the North Carolina-styled vinegar based sauce with its molasses sweet, assertive acidity, and hot pepper piquancy that wakes up the diner an insatiable appetite for this scrumptious perfectly-cooked ribs. Some usual sides of Potato Salad and Coleslaw proved to be adequately good but nothing out of the ordinary. 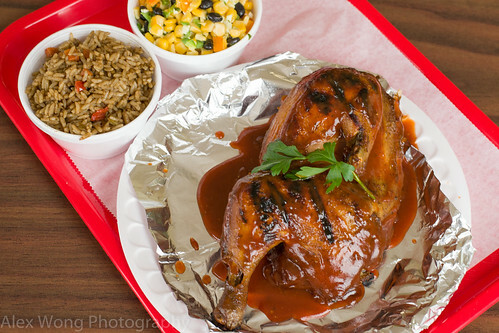 For those not into red meat, there is the Barbeque Chicken. The half chicken came smoked and slightly grilled judging from the burn marks on the skin. The flesh was flavorful from being cooked in the smoker, faintly aromatic from the use of fresh rosemary (aha, I found a tiny piece), and tender yet moist (including the breast meat) from the proper treatment. The sauce topping was a redder and lighter color than the above version with its sweetness, less-assertive vinegar-base, and some chili heat zinging through it. A couple of sides completed the meal. The Dirty Rice is not your usual Southern version; this was flavored from mirepoix (fine dices of celery, onion, and peppers) and colored from probably burned sugar (a common Caribbean practice, which the chef’s parents hail from) and a good pinch of cumin that added the initial je-nais-sais-qoui moment which turned into a gentle smile on this reviewer’s face. The Texas Street Corn is a mélange of slightly crunchy sweet fresh corn, mixed with some vegetal tasting crunchy bell peppers, freshly-cooked black beans, biting jalapeño peppers, fragrant cilantro, a hit of tangy feta cheese, all tied together by a touch of cream. I enjoyed this bowl full of its fresh quality and the various textural and taste elements that each bite had. It was more like Texas Chef Corn rather than a street version for me, which is a good thing here. From the menu of specials, I chose the Bacon Wrapped BBQ Quail for lunch. 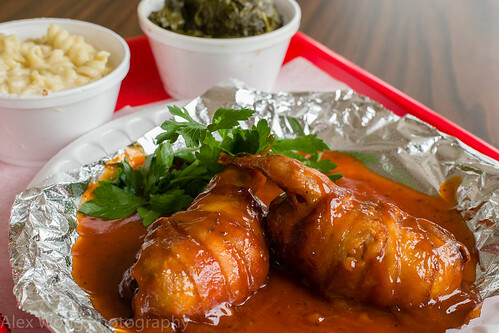 Pieces of the poultry are filled with a bread stuffing, wrapped with a piece of bacon and slathered with the similar sauce as the chicken. Wow! The quail was fairly firm but still quite moist, complemented by a bold stuffing packed with flavor from some sausage (the cook didn’t want to divulge the type) and mirepoix. The outer layer of bacon was slightly crispy adding its porcine smoky flavor to each bite. The sauce was the perfect complement being the lighter version than the one served with the beef ribs. A side of collard greens was a good pairing with the meal with its tender leaves made tasty from the use of flavored stock (a minute sliver of smoked meat was the giveaway) and tangy from a good hit of spicy vinegar which is a North Carolinian and Mid-Southern tradition. But what stole the show here was the Mac & Cheese. The bowl of creamed pasta was not your typical Momma’s. This came with spiral pasta, white from the sauce that packed a tangy punch with the use of either Gorgonzola or Bleu Cheese which took this pedestrian side dish to another direction with gastronomic interest. If weren’t for its caloric health warning, another bowl of this rich noodle would have made its way to my table. Sitting on the order counter is a display of desserts tempting the diner to save space for these sweet treats. 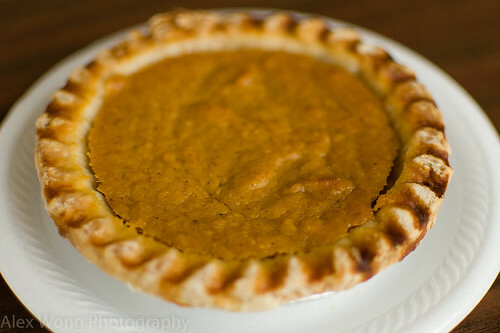 A friend’s order of the Sweet Potato Pie was a homerun for him. This miniature pie had a firm yet buttery and flaky crust, filled with a not-too-sweet and moist filling spiced up by the usual cinnamon-clove-nutmeg combo that was distinctive but not overpowering. This sweet bite reminded my friend of a good home-made sweet concoction served on celebrations and holidays. On another visit, Bread Pudding was my choice for the finale. The sweet square was denser that what I expected, not too sweet, fragrant from baking spices, and sweetened with soaked raisins. The topping sauce was literally the icing on the cake. It was rich from the use of cream, sweet and dark from caramelized sugar, and heady from some vanilla and probably a touch of booze, reminding me of butter scotch sauce. This dessert was worth following my personal motto that desserts should only be eaten when the calories are worthwhile, and indeed this was the case. 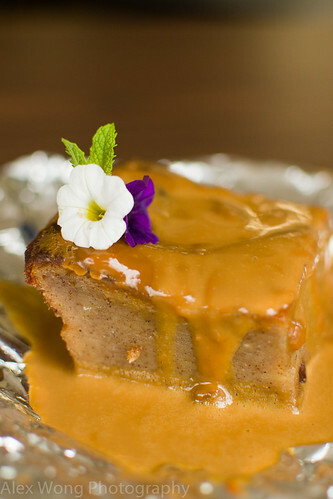 An order of the Glazed Lemon Pound Cake was quite good with the noticeable lemon essence and the rich buttery cake. However, it was a tad dry for me and its butteriness was too much of a good thing for this reviewer who is trying to shed a few pounds for the summer. After only a few months under new management, the dining room of RG’s BBQ Café has been filled without a lick of advertisement, relying solely on the word of mouth and online reviews, and deservingly so. While respecting traditions and injecting some culinary experience and acumen, the offerings in this smoke house cater to those who want the expected (and receiving an excellent product) and those who are willing to go beyond the traditional. With food this good and exciting, I could see myself sitting in their new outdoor patio during the warm months, and with such delectable temptations offered here, such visits will definitely extend beyond the short lazy summer months. Sounds like a great place. What was the pricing like on the items you got (ribs, BBQ chicken and pulled pork in particular)? Most prices are under $10. Some are just above that price. Very reasonable for the quantity and quality. 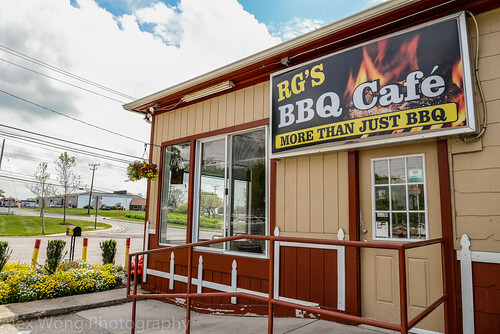 A tasty lunch and warm weather spell only one thing – RG’s BBQ.